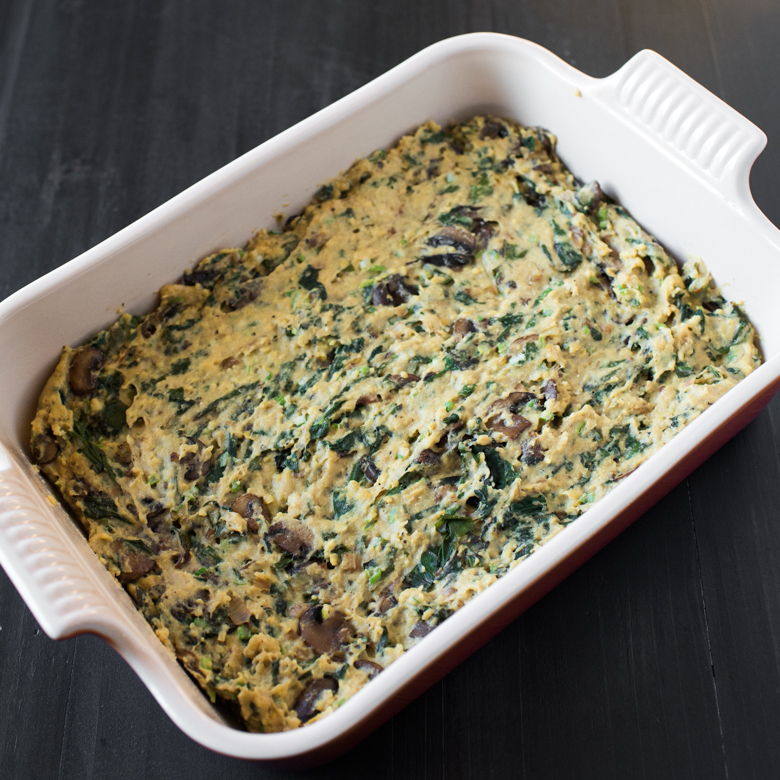 Today, as our journey through Deb Perleman’s book continues, Spinach, Mushroom, and Goat Cheese Slab Frittata is on the menu! Last week, we made the Breakfast Polenta Bake, omitting the eggs and cheese, and subbing in nutritional yeast. That was pretty easy, because the polenta was the bulk of the dish. To “veganize” this dish would take a little more research. I’ve heard of tofu scrambles, and though I’ve never made one, I wasn’t convinced that it would mimic the texture and girth of what I wanted this dish to be. Then, I heard about people using chickpea or garbanzo bean flour to bring vegan “egg” dishes to life. I was still skeptical, but kept digging. 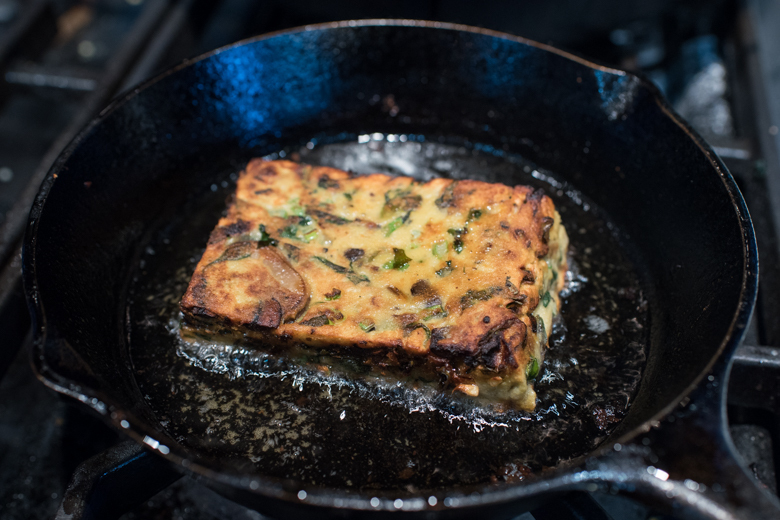 It was then that I finally stumbled on David Lebovitz‘ recipe for Panisse, and I finally got it. The problem calling things a “vegan frittata” is that the ingredients get lost. What the f&$* is in a vegan frittata?! Then you go down this rabbit hole of not knowing what you’re really eating. Whatever you’re eating is vegan, but you don’t know what the heck it is made out of, and surely don’t know what kind of nutrients you’re putting in your body. A panisse is made by re-constituting chickpea flour with water. It’s made just like polenta – by heating up water, and slowly whisking in the flour, to make a smooth paste. You cook it for awhile, and pour it into a dish. Just like polenta, it sets up, then you cut and fry it up. The result is a lovely morsel that is crispy on the outside, and has a custard-like texture on the inside. So, since it’s kind of like eggs in the custard-y sense, I figured it would be a great substitute in Deb’s recipe. Needless to say, they turned out AMAZING. 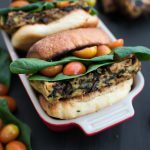 You can serve them on a bed of lettuce with tomatoes, or serve them like I did here – on ciabatta rolls with fresh spinach and tomato. 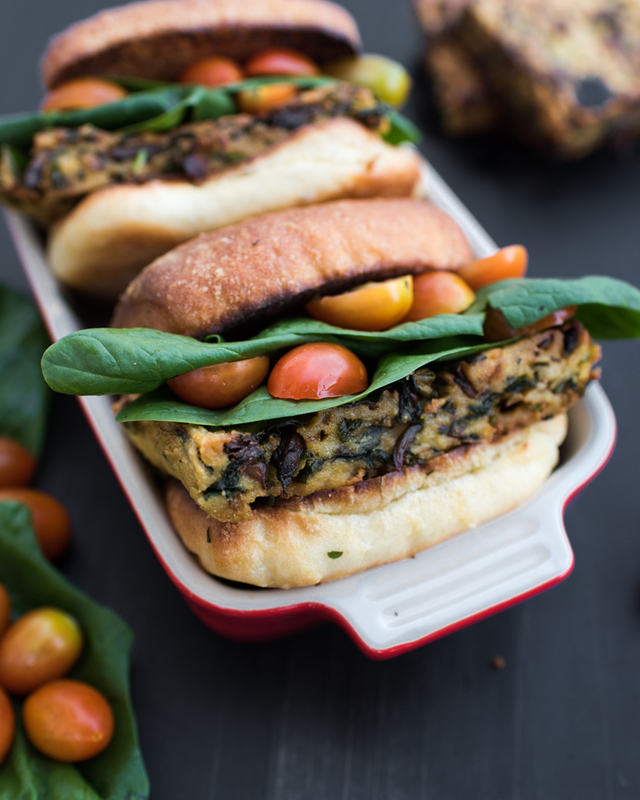 You can also add a slice of vegan cheese to really make it a breakfast party! If you’d like to cook through Deb Perleman’s book with us, make sure you join our Facebook group, Tuesday’s Menu! There’s a schedule up where you choose one of the listed recipes, and every other week, we share our experiences! Come along, and join the fun! Panisse is a dish from the region of Provence, France, consisting of chickpea flour that is hydrated with water, and allowed to cool. Like polenta, it hardens as it cools, is sliced into planks, then fried, making a crispy exterior, and custard-like interior. 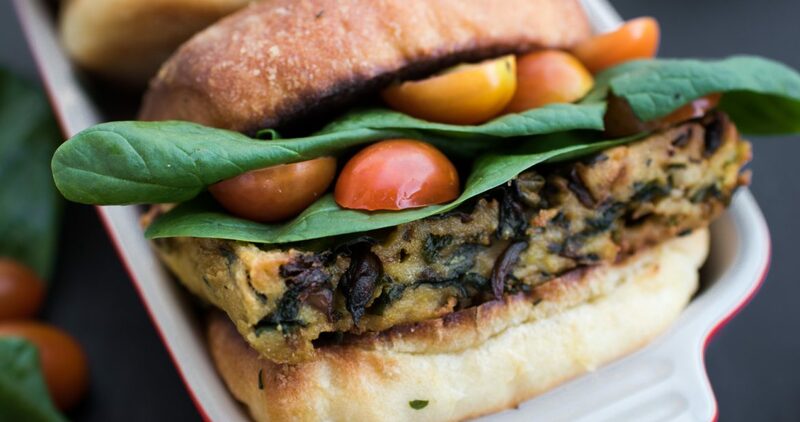 This features sautéed mushrooms and beet greens, and is utterly amazing! Lightly oil a 9 x 13 inch cake pan, using spray oil. In a large skillet over medium heat, add the olive oil. Once the oil starts to shimmer, add in the onion, and cook for about 5 minutes, or until soft and slightly translucent. Add in the sliced mushrooms a little at a time as to not crowd the pan, about 2 minutes after each addition. I like to slice the mushrooms as I go, adding a good handful at a time until the mushrooms are all gone. Add in the garlic, half the salt, pepper, and nutmeg after all the mushrooms have been added to the pan, and cook the mixture until the mushrooms have lost all their liquid, and have browned a bit on the edges, about 5 minutes. Put the chopped beet greens on top of the mushroom mixture, and using tongs, continually toss until the beet greens are wilted and cooked down. Remove from heat, and set aside. Heat a medium pot over medium heat, and add the water. Bring to a gentle boil, and slowly add in the chickpea flour while whisking continually. When all the flour is fully mixed into the water, and there are no lumps, switch to a large wooden spoon, and cook for 8 minutes, until the mixture has thickened slightly. Add in the remaining salt, nutritional yeast, scallions, and mushroom/beet greens mixture, mixing well. Working quickly, spread the hot chickpea mixture in your 9 x 13 pan, smoothing over the top. Allow to cool for 15-20 minutes, or until cool to the touch. 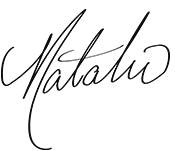 Using a sharp knife, slice once long-ways in the center of the pan, then cut into thirds the other way, making 6 squares. Heat vegetable oil in a medium skillet, and working in batches, fry the squares on each side for about 4 minutes, or until a golden brown crust forms. Remove to a paper towel lined plate. 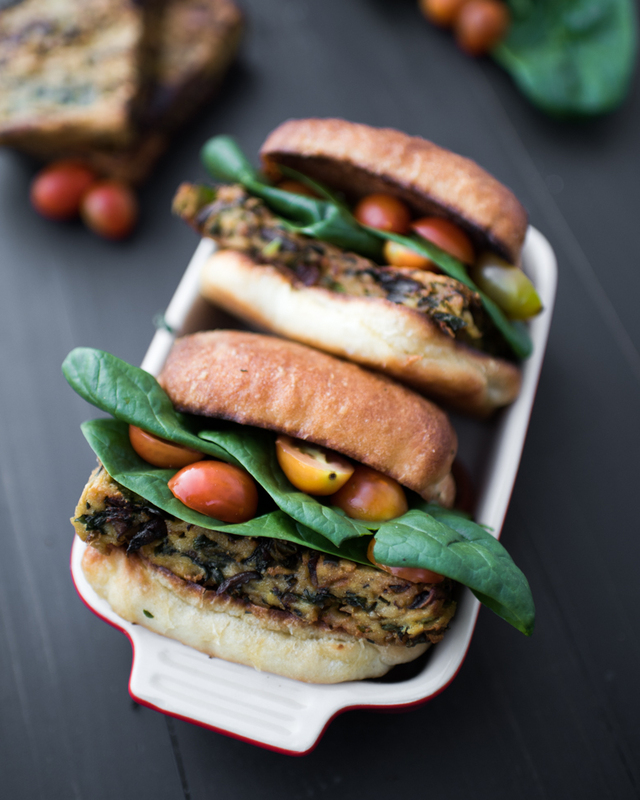 Once the frying is finished, serve on a bed of lettuce with tomatoes, or the panisse can be used to make a hearty breakfast sandwich with fresh spinach and tomatoes, as shown. 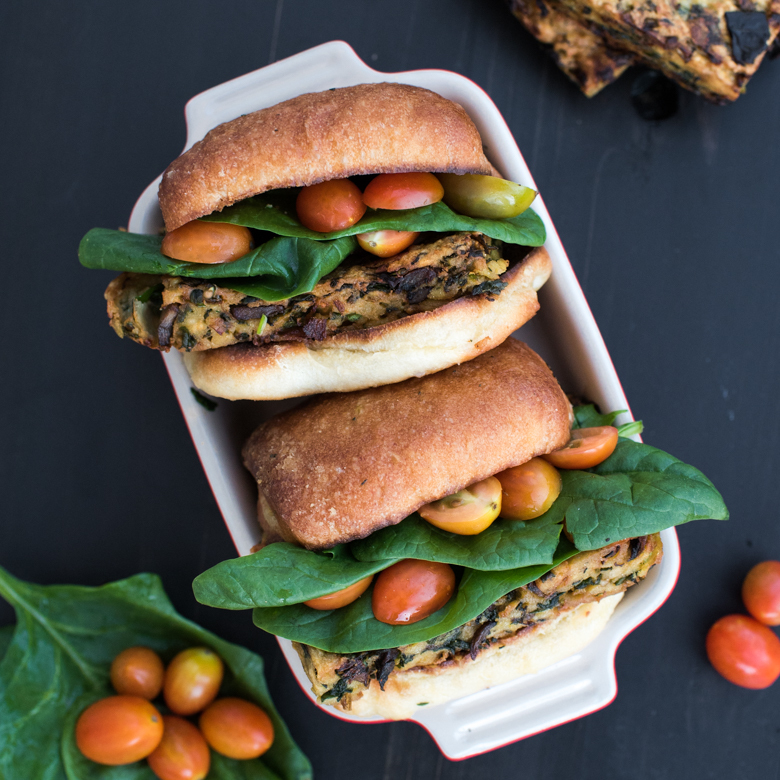 This is a great way to use up beet greens! I used the greens from two bunches. If you don't have beet greens, you could substitute baby spinach. You’re right, this was much better than any vegan ‘frittata’ I’ve had, and besides it being super tasty I felt good about what I was eating! I may have doubled the beets in this because I’m a huge beet lover, but either way, it was scrumptious! Thanks for sharing! Sam, I’m so glad you enjoyed it! Thanks for sharing…. I’m a beet lover too!